Nothing beats those genuine smiles that come from getting someone that perfect gift. 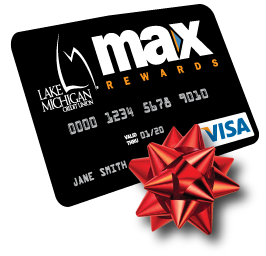 As if that weren’t enough, every purchase you make with a LMCU Max Rewards Visa comes with a reward of its own, all year long. Get 3% on gas*, 2% on groceries and 1% on everything else when you use your Max Rewards card. It’s like getting an extra little thank-you with every purchase. Apply online today at lmcu.org, or visit any branch. *Maximum earned on first $500 spent on gas/month, 1% after maximum is reached.